Yesterday was National Selfie Day. If you blinked you may have missed it, or maybe you were too busy taking selfies. 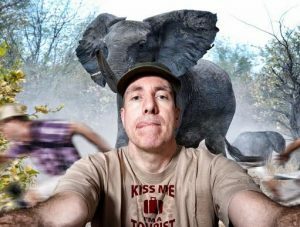 It was also the shortest day of the year (in the Southern Hemisphere), so Southern Cross Travel Insurance (SCTI) got into the act quickly, urging travellers to put their safety before their selfie with research revealing selfie fails are costing Aussies up to AUD 200,000. From ‘hot dogs or legs?’ to ‘belfies’, Aussie travellers have become so obsessed with documenting their holiday escapades, 12% admit they would ditch a destination if they couldn’t take selfies, SCTI advises. A belfie, for those unfamiliar with the term, is a photographic self-portrait featuring the buttocks, usually posted by female celebrities on social media networks. If helps if you are young, female and have well toned buttocks. If you’re a celebrity as well, even better! Launching his message on National Selfie Day, White said he wanted to “remind travellers with a penchant for selfies” to think about the repercussions of their selfie situation. Using your phone while driving is dangerous as it is, yet surprisingly some tourists admit to taking selfies behind the wheel. In some places, you’ll also receive a fine if you’re caught using it. Putting safety before your selfie is key, it’s not worth risking your or anyone else’s health. Dangerous encounters with animals can be a common occurrence for travellers overseas. Avoid getting up close and personal with wild animals if there’s a chance they could turn vicious. Some animals can also pinch personal belongings while travellers are trying to get the perfect selfie. Different destinations have sensitivities surrounding acceptable behaviour and photography at certain landmarks, particularly if they are religious or historical. Avoid offending the residents by reading up on the local etiquette and respecting the rules if photography or selfie sticks are prohibited. While taking the perfect snap, it’s easy to forget your surroundings and the potential risks of leaving items out of sight. Ensure you’re aware of your personal items, being mindful that you’re not covered by insurance if something is stolen whilst left unattended. With some Aussie tourists taking up to 40 selfies a day while on holiday, it’s important to keep your tech gadgets safe while making memories! Broken phones can result in lost memories and empty pockets, so take extra care of your belongings while travelling! With underwater selfies becoming increasingly popular, ensure you invest in a good quality water proof case so your belongings aren’t damaged. For the keen photographers, a good way to keep your tech safe is by investing in an anti-theft bag. This way, when you’re not snapping selfies you have nothing to worry about.